As we look back on 2016, a notable theme is just how wrong the markets were when it came to predicting events and risk drivers. The year began on a pessimistic note. 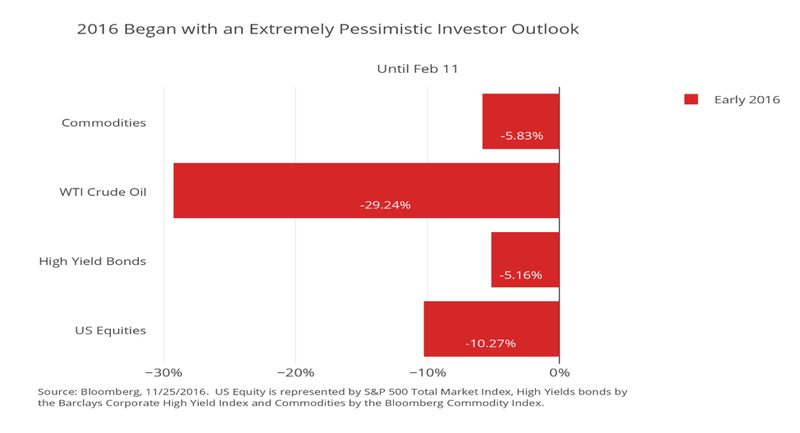 By the February 11 low, the S&P 500 had lost more than 10%, and high-yield bonds were down more than 5%. A major culprit was sharply declining oil prices; WTI crude was down nearly 30%, which drove down commodities as a whole. Market jitters were also caused by expectations that China’s growth rate was going to fall short, which further compounded concerns about global growth in general. Now, at year end, the picture looks much different. Global growth in 2016 couldn’t have been better. In the U.S., a third quarter GDP reading of 3.2% exceeded expectations. Meanwhile, China grew steadily in 2016 at a rate of about 6.7%. As a result, over the first 10 months of 2016, investors have poured more than $50 billion into emerging market stock and bond funds. 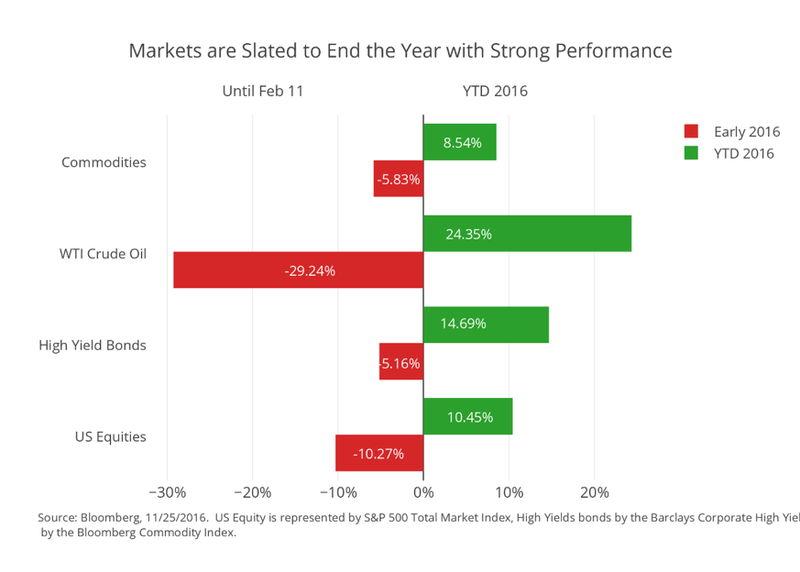 As for market performance, year-end is nearly a mirror opposite of what occurred at the start of the year. From January through end-November, the S&P 500 is up about 10%. High-yield bonds are up more than 15% year-to-date, and oil has gained almost 25%. The second major thing that the markets got wrong was the expectation for rate hikes by the Federal Reserve. When 2016 began, the expectation was that four rate hikes were likely. In January, Fed Vice Chairman Stanley Fischer said that four rate hikes for the year were “in the ballpark,” although China’s slower economy and other uncertainties made it impossible to predict what would happen to interest rates. The concern in early 2016 was that if the Fed pursued the expected course, the U.S. would go in one direction with interest rates, while the rest of the world was headed lower; in some countries more negative rates were possible. As we now know, the Fed took a more guarded stance in 2016, following its December 2015 move, which was the first rate hike in almost a decade. This change in expectations affected currencies most of all. 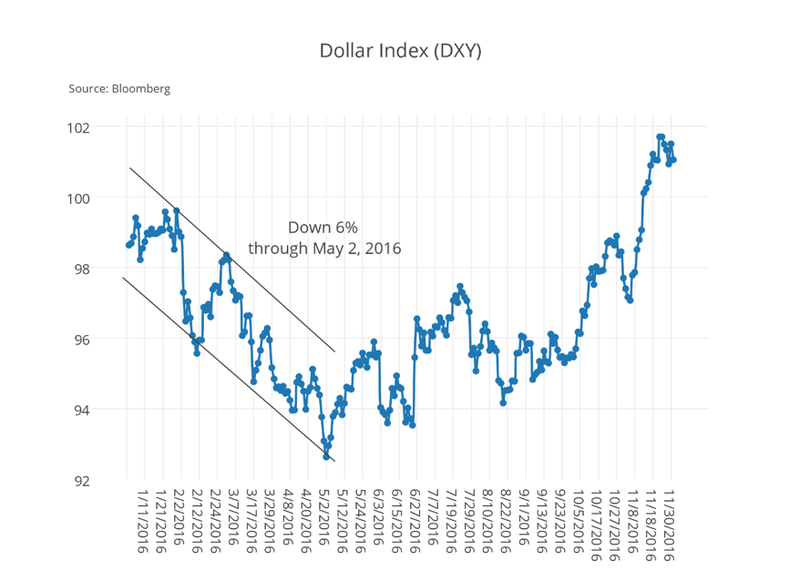 The U.S. dollar was expected to rally, but fell 6% in the first half of the year. In contrast, the Japanese yen appreciated through August due to safe haven trades. Now that we are at the end of the year, we can see how the markets did adjust to changing realities. In fact, both the Fed and the market appear to be aligned. The widespread expectation, already priced into the market, is that the Fed will raise rates at its mid-December FOMC meeting. The year, though, is not over yet. No matter how clear things may appear, we still think predicting policy events, central bank actions, and the market’s reactions will always be a challenge.